My Wounded Island is a beautifully illustrated picture book that relates the impact of climate change on the tiny island of Sarichef, near the Arctic Circle, between Russia and Alaska. The story is narrated by a young girl named Imarvaluk,“the song of the waves.” She tells us about the challenges that her community faces in attempting to take refuge from the rising sea levels. In her family’s case, this involves towing their house further inland. Knowing that this is just a temporary solution, the villagers are faced with the inevitability of relocation. 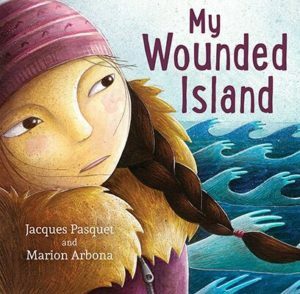 Classroom Connections: My Wounded Island takes a look at a very real threat from the unique perspective of a child. It would make an excellent introduction to the topic of climate change and climate refugees and would be a great read-aloud book for primary classes. This review is from Candian Teacher Magazine’s Winter 2018 issue.